SPA effect and true pleasure of face care! Classic series of Dizao Natural consists of 19 masks for face&neck and for the eye area. Masks of series have innovative 2-Stage patented formula. This formula allows them to work with efficiency of two products. 1 Stage is a professional mask for face&neck and the eye area. Each mask of the series brings about its own effect: moisturizing, firming, shaping, antioxidant, anti-aging or nourishing. 2 Stage is natural ceramids, which are the same for all masks of the series. Natural ceramids are applied after a mask and help active ingredients to be absorbed in the skin more effectively,magnify effect of a mask, moisturize the skin and improve its elasticity. The main advantage of Dizao masks is that every woman can chose a combination of effects, that is suitable for her. Such a wide range of effects is archived by various natural ingredients which are accounted for 99,6% of all components of Dizao masks. We use a lot of different ingredients, such as cucumber, ginseng or exotic corrals and shark oil. We also developed our own original compositions of ingredients which are implemented in the compound masks such as “Fruit Acids”, ”Tenderness”, ”Tibetan Herbs”. 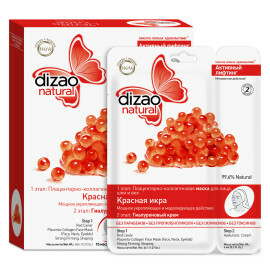 Another advantage of Dizao masks is ship placenta, which is a key ingredient to most products of the series. Ship placenta provides skin cells with energy of youth. All Dizao masks are made in CPR. The price stated for 10 masks. Dizao masks do not cause allergy and can be used even for very sensitive skin.